The King's Speech is a 2010 British biographical drama film directed by Tom Hooper and written by David Seidler. Colin Firth plays King George VI who, to cope with a stammer, sees Lionel Logue, an Australian speech and language therapist played by Geoffrey Rush. The men become friends as they work together, and after his brother abdicates the throne, the new king relies on Logue to help him make his first wartime radio broadcast on Britain's declaration of war on Germany in 1939. Seidler read about George VI's life after overcoming a stuttering condition he endured during his youth. He started writing about the relationship between the monarch and his therapist as early as the 1980s, but at the request of the King's widow, Queen Elizabeth The Queen Mother, postponed work until her death in 2002. He later rewrote his screenplay for the stage to focus on the essential relationship between the two protagonists. Nine weeks before filming began, Logue's notebooks were discovered and quotations from them were incorporated into the script. 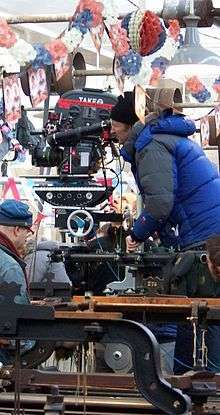 Principal photography took place in London and around Britain from November 2009 to January 2010. The opening scenes were filmed at Elland Road, Leeds, and Odsal Stadium, Bradford, both locations standing in for the old Wembley Stadium. For indoor scenes, Lancaster House substituted for Buckingham Palace, and Ely Cathedral stood in for Westminster Abbey, while the weaving mill scene was filmed at the Queen Street Mill in Burnley. The cinematography differs from that of other historical dramas: hard light was used to give the story a greater resonance and wider than normal lenses were employed to recreate the King's feelings of constriction. A third technique Hooper employed was the off-centre framing of characters: in his first consultation with Logue, George VI is captured hunched on the side of a couch at the edge of the frame. Released in the United Kingdom on 7 January 2011, The King's Speech was a major box office and critical success. Censors initially gave it adult ratings due to profanity, though these were later revised downwards after criticism by the makers and distributors in the UK and some instances of swearing were muted in the US. On a budget of £8 million, it earned over £250 million internationally ($400 million). It was widely praised by film critics for its visual style, art direction, and acting. Other commentators discussed the film's representation of historical detail, especially the reversal of Winston Churchill's opposition to abdication. 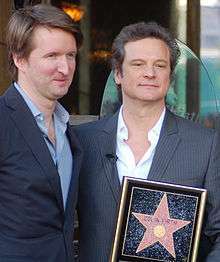 The film received many awards and nominations, particularly for Colin Firth's performance; his Golden Globe Award for Best Actor was the sole win at that ceremony from seven nominations. The King's Speech won seven British Academy Film Awards, including Best Film, Best Actor (Firth), Best Supporting Actor (Rush), and Best Supporting Actress (Helena Bonham Carter). The film also won four Academy Awards: Best Picture, Best Director (Hooper), Best Actor (Firth), and Best Original Screenplay (Seidler). Prince Albert, Duke of York, the second son of King George V, stammers through his speech closing the British Empire Exhibition at Wembley Stadium. The Duke has given up hope of a cure, but his wife Elizabeth persuades him to see Lionel Logue, an Australian speech therapist living in London. During their first private session, Logue insists on being called Lionel by his patient. In addition, breaching royal etiquette, Logue calls the Prince "Bertie", a name used only by his family. When the Duke decides Logue's treatment is unsuitable, Logue bets him that he can recite Hamlet's "To be, or not to be" soliloquy without trouble and distracts him by playing music through headphones while recording his performance on an acetate record. Prince Albert leaves in anger but Logue offers him the recording as a keepsake. After King George V makes his 1934 Christmas radio address, he explains to his son the importance of broadcasting to a modern monarchy and demands that Albert train himself, starting with a reading of his father's speech. His attempt to do so is a failure. Later, the Duke plays Logue's recording and hears himself reciting unhesitatingly. He therefore returns to Logue, where he and his wife both insist that Logue focus only on physical exercises, not therapy. Logue teaches his patient muscle relaxation and breath control but continues to probe gently and persistently at the psychological roots of the stutter. Albert eventually reveals some of the pressures of his childhood and the two men start to become friends. With George V’s death in 1936, his eldest son David ascends the throne as King Edward VIII, but causes a constitutional crisis with his determination to marry Wallis Simpson, an American socialite divorcée who is still legally married to her second husband. It is pointed out that Edward, as head of the Church of England, cannot marry her, even if she receives her second divorce, because both her previous husbands are alive. At his next session, Albert expresses his frustration that while his speech has improved when talking to most people, he still stammers when talking to his own brother and reveals the extent of Edward VIII's folly with Simpson. When Logue insists that Albert could be a good king instead, the latter labels such a suggestion as treason and dismisses Logue. When King Edward decides to abdicate in order to marry Simpson, Albert reluctantly succeeds him as King George VI. The new king and queen visit Logue to make up the quarrel, startling Mrs. Logue, who was unaware that the new King had been her husband's patient. During preparations for his coronation in Westminster Abbey, George learns that Logue has no formal qualifications. When confronted, Logue explains how he was asked to help shell-shocked Australian soldiers returning from The Great War. Since George remains unconvinced of his own fitness for the throne, Logue sits in King Edward's Chair and dismisses the underlying Stone of Scone as a trifle. Goaded by Logue's seeming disrespect, the King surprises himself with his own sudden burst of outraged eloquence and allows Logue to rehearse him for the ceremony. Upon Britain's declaration of World War II with Nazi Germany in 1939, King George summons Logue to Buckingham Palace to prepare for his upcoming radio address to Britain and the Empire. Knowing the challenge that lies before him, the Archbishop of Canterbury, Winston Churchill and Prime Minister Neville Chamberlain are present to offer support. George and Logue are then left in the broadcasting room. He delivers his speech with Logue conducting him, but by end is speaking freely. Preparing to leave the room for the congratulations of those present in the palace, Logue mentions to the King that he still had difficulty enunciating 'w' and the King jokes back, "I had to throw in a few so they'd know it was me". After the King and his family step onto the balcony of the palace and are applauded by the crowd, a title card explains that Logue was always present at King George VI's speeches during the war and that they remained friends for the rest of their lives. 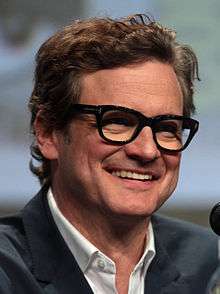 Third choice to play the lead, Colin Firth's performance earned him BAFTA and Academy awards, among others. As a child, David Seidler developed a stammer, which he believes was caused by the emotional trauma of World War II and the murder of his grandparents during the Holocaust. King George VI's success in overcoming his stammer inspired the young Seidler, "Here was a stutterer who was a king and had to give radio speeches where everyone was listening to every syllable he uttered, and yet did so with passion and intensity." When Seidler became an adult, he resolved to write about King George VI. During the late 1970s and 1980s he voraciously researched the King, but found a dearth of information on Logue. Eventually Seidler contacted Dr. Valentine Logue, who agreed to discuss his father and make his notebooks available if the Queen Mother gave her permission. She asked him not to do so in her lifetime, and Seidler halted the project. The film's producers broke etiquette by hand-delivering Geoffrey Rush the script, but he liked it and eventually performed in and produced the film. The production team learned—some nine weeks prior to the start of filming—of a diary containing Logue's original notes on his treatment of the Duke. They then went back and re-worked the script to reflect what was in the notes. Hooper said some of the film's most memorable lines, such as at the climax, when Logue smiles, "You still stammered on the W" to the King, who replies, "I had to throw in a few so they would know it was me" were direct quotations from Logue's notes. Changes from the script to reflect the historical record included Michael Gambon improvising the ramblings of George V as he signed away authority, and the decision to dress the Duke in an overcoat rather than regal finery in the opening scene. The set design presented a challenge for the film-makers: period dramas rely to an extent on the quality of production, but their budget was a relatively limited £8 million. The film had to be authentic—combining regal opulence with scruffy, depression-era London. On 25 November 2009, the crew took over the Pullens buildings in Southwark. The entire street was transformed into 1930s London. 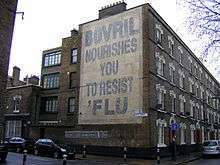 Large advertisements, for (among other things) Bovril and fascism were placed on the walls; streets were sprayed with grit and buildings with grime. A neighbour of Hooper's had told him the smog in London at the time was so thick that cars had to be guided by someone walking in front. To create this scene the crew pumped in so much artificial smoke that the fire alarms in a nearby boutique sounded. According to Hooper, the scene was a good opportunity to show Logue's socio-economic background. Lancaster House, an opulent, government-owned period house in London, was used for the interiors of Buckingham Palace that the King walks through prior to making his speech and for the official photograph afterwards; it cost £20,000 a day to rent. The 1936 Accession Council at St. James's Palace, where George VI swore an oath, was filmed in February in the Livery Hall of Drapers' Hall, after principal photography had been completed. The room, ornate and vast, met the occasion: the daunting nature of the new King's responsibilities was shown by surrounding him with rich detail, flags and royal portraiture. Roger Ebert noted that the majority of the film was shot indoors, where oblong sets, corridors, and small spaces manifest constriction and tightness, in contrast to the usual emphasis on sweep and majesty in historical dramas. Hooper used wide shots to capture the actors' body language, particularly Geoffrey Rush, who trained at L'École Internationale de Théâtre Jacques Lecoq in Paris and "is consequently brilliant in the way he carries his body". Hooper widened his scope first to capture Rush's gestures, then full body movements and silhouettes. The approach carried over to Firth as well. In the first consultation scene, the Duke is squeezed against the end of a long couch framed against a large wall, "as if to use the arm of the sofa as a kind of friend, as a security blanket?" Martin Filler praised the "low-wattage" cinematography of Danny Cohen, as making everything look like it has been "steeped in strong tea". At other times, the camera was positioned very close to the actors to catch the emotion in their faces: "If you put a lens 6 inches from somebody's face, you get more emotion than if you're on a long lens 20 feet away," Cohen said in an interview. Hooper sought a second subtlety while filming the first consultation room scene between the two men, having placed the camera 18 inches from Colin Firth's face: "I wanted the nervousness of the first day to percolate into his performances." Historical dramas traditionally tend to use "soft light", but Hooper wanted to use a harsher glare, which gives a more contemporary feel, and thus a greater emotional resonance. To achieve the effect, the lighting team erected huge blackout tents over the Georgian buildings, and used large lights filtered through Egyptian cotton. 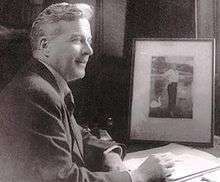 The filmmakers not only tightened the chronology of the events to just a few years but even shifted the actual timeline of treatment: the Duke of York actually began work with Logue in October 1926, ten years before the abdication crisis, and the improvement in his speech was apparent in months rather than years, as is suggested by the film. In a 1952 newspaper interview with John Gordon, Logue said that "Resonantly and without stuttering, he opened the Australian parliament in Canberra in 1927"; this was just seven months after the Duke began to work with Logue. Hugo Vickers, an adviser on the film, agreed that the alteration of historical details to preserve the essence of the dramatic story was sometimes necessary. The high-ranking officials, for instance, would not have been present when the King made his speech, nor would Churchill have been involved at any level, "but the average viewer knows who Churchill is; he doesn't know who Lord Halifax and Lord Hoare are." Christopher Hitchens and Isaac Chotiner challenged the film's portrayal of Winston Churchill's role in the abdication crisis. It is well established that Churchill encouraged Edward VIII to resist pressure to abdicate, whereas he is portrayed in the film as strongly supportive of Prince Albert and not opposed to the abdication. Hitchens attributes this treatment to the "cult" surrounding Churchill's legacy. In a smart, well-made film "would the true story not have been fractionally more interesting for the audience?" he wondered. They also criticised the film for failing to indict the appeasement of the era. While the film never directly mentions the issue, Hitchens and Chotiner argue that it implies that George VI was against appeasement, especially in the final scene portraying "Churchill and the King at Buckingham Palace and a speech of unity and resistance being readied for delivery". Far from distancing himself from Chamberlain's appeasement policy, King George VI dispatched a car to meet Neville Chamberlain when he returned from signing the Munich Agreement with Hitler in September 1938. The King and Chamberlain then stood on the balcony of Buckingham Palace, acclaimed by cheering crowds. This led historian Steven Runciman to write that by acting as he did to endorse Chamberlain's foreign policy, King George VI perpetrated "the biggest constitutional blunder that has been made by any sovereign this century." The Guardian corrected the portrayal of Stanley Baldwin as having resigned due to his refusal to order Britain's re-armament, when he in fact stepped down as "a national hero, exhausted by more than a decade at the top". Martin Filler acknowledged that the film legitimately used artistic licence to make valid dramatic points, such as in the probably imagined scene when George V lectures his son on the importance of broadcasting. Filler cautions that George VI would never have tolerated Logue addressing him casually, nor swearing, and the King almost certainly would have understood a newsreel of Hitler speaking in German. Filler makes the larger point that both the King and his wife were, in reality, lukewarm towards Churchill because of the latter's support for his brother during the abdication crisis. They only warmed to Churchill later in the war, because of his performance as a wartime leader. Commenting on the film's final scene on the balcony of Buckingham Palace, Andrew Roberts has written, "The scene is fairly absurd from a historical point of view – Neville Chamberlain and Winston Churchill were not present and there were no cheering crowds outside Buckingham Palace." Overall, Roberts praises the film as a sympathetic portrayal of the King's "quiet, unassuming heroism", and he states: "The portrayals by Firth and Bonham Carter are sympathetic and acute, and the movie’s occasional factual bêtises should not detract from that." The film was initially given a 15 certificate by the British Board of Film Classification, due to a minute-long scene where Logue encourages the King to shout profanities, which he could do so without stuttering. At the London Film Festival, Hooper criticised the decision, questioning how the board could certify the film "15" for bad language but allow films such as Salt (2010) and Casino Royale (2006) to have "12A" ratings, despite their graphic torture scenes. Following Hooper's criticism, the board lowered the rating to "12A", allowing children under 12 years of age to see the film if they are accompanied by an adult. Hooper levelled the same criticism at the Motion Picture Association of America, which gave the film an "R" rating, preventing anyone under the age of 17 from seeing the film without an adult. In his review, Roger Ebert criticised the "R" rating, calling it "utterly inexplicable", and wrote, "This is an excellent film for teenagers." Of the film's net profit, estimated to amount to $30–40 million (£20–25 million) from the cinema release alone, roughly 20% will be split between Geoffrey Rush (as executive producer), Tom Hooper and Colin Firth, who receive their bonuses before the other stakeholders. The remaining profit is to be split equally between the producers and the equity investors. The UK Film Council invested £1 million of public funds from the United Kingdom lottery into the film. In March 2011 Variety estimated that the return could be between fifteen and twenty times that. The Council's merger into the British Film Institute means that the profits are to be returned to that body. The King's Speech has received widespread critical acclaim, with Firth's performance receiving strong acclaim. Rotten Tomatoes gives the film a score of 95% based on reviews from 265 critics; their average rating was calculated as 8.6/10. It summarised the critical consensus as: "Colin Firth gives a masterful performance in The King's Speech, a predictable but stylishly produced and rousing period drama." Metacritic gave the film a weighted score of 88/100, based on 41 critiques, which it ranks as "universal acclaim". CinemaScore reported that audiences gave the film a rare "A+" grade. Empire gave the film five stars out of five, commenting, "You'll be lost for words." Lisa Kennedy of the Denver Post gave the film full marks for its humane qualities and craftsmanship: "It is an intelligent, winning drama fit for a king – and the rest of us", she said. Roger Ebert of the Chicago Sun-Times awarded the film a full four stars, commenting that "what we have here is a superior historical drama and a powerful personal one." Peter Bradshaw of The Guardian gave four stars out of five, stating, "Tom Hooper's richly enjoyable and handsomely produced movie ... is a massively confident crowd-pleaser." It is also the first Weinstein film to win the Oscar for Best Picture. A Month in the Country (1987), in which Colin Firth plays a stammering World War I veteran. ↑ "The King's Speech rated 12A by the BBFC". British Board of Film Classification. Retrieved 17 September 2011. ↑ Smith, N. (28 February 2011). "Oscars 2011: Film Council basks in King's Speech glory". BBC News. Retrieved 28 February 2011. 1 2 "Never mind the Baftas ... who will get The King's Speech riches?". The Guardian. Retrieved 28 February 2011. 1 2 "The King's Speech". Box Office Mojo. Retrieved 20 May 2011. 1 2 Walker, T. (20 January 2011) "Colin Firth was the third choice to play George VI in The King's Speech". The Daily Telegraph. Retrieved 20 August 2011. 1 2 3 Seidler, D. (20 December 2010). "How the 'naughty word' cured the King's stutter (and mine)". Daily Mail. Retrieved 3 February 2011. ↑ Spencer, Adam (21 January 2011). "The King's Speech: From Geoffrey Rush's letterbox to the big screen". 702 ABC Sydney. Retrieved 2 March 2011. 1 2 Gritten, D. (23 December 2010). "Tom Hooper Interview for the King's Speech". The Daily Telegraph. Retrieved 2 February 2011. 1 2 3 Unwin, G. (3 January 2011). "Crowning Glory: How The King's Speech got made". The Independent. Retrieved 2 February 2011. ↑ "Finding the real King's Speech". BBC. 4 January 2011. Retrieved 8 January 2011. ↑ Addiego, Walter (4 February 2011). "Q&A with 'King's Speech' director Tom Hooper". San Francisco Chronicle. Retrieved 2 September 2011. 1 2 3 4 5 6 7 Thomas Hooper (Director) (9 May 2011). 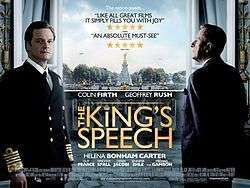 The King's Speech (PAL)|format= requires |url= (help). Momentum Pictures Home Ent. ASIN: B0049MP72G. ↑ "Awards database The King's Speech". UK Film Council. Retrieved 5 February 2011. 1 2 3 4 Bedell, G. (2 January 2011). "The King's Speech: How clever sets create a compelling picture of 1930s London" The Observer. Retrieved 2 February 2011. ↑ Sparham, Laurie (10 December 2010). "The King's Speech: set report". The Daily Telegraph. London. Retrieved 28 May 2011. ↑ Staff (25 November 2009). "Cathedral starring again in blockbuster". Cambridge News. Retrieved 6 December 2009. ↑ Staff (4 December 2009). "The King's Speech: Colin Firth and Bonham Carter in Ely". BBC Cambridgeshire. Retrieved 6 December 2009. ↑ "The King’s Speech film locations". www.movielocations.com. Retrieved 4 August 2011. ↑ Palmer, Martyn (6 February 2011). "The making of a very British smash hit". Daily Mail. Retrieved 25 March 2011. ↑ Huddleston, Tom. "On the set of 'The King's Speech'". Time Out. Retrieved 25 March 2011. ↑ "Firth is lost for words as the monarch whose dilemma gripped the country". Yorkshire Post. 3 January 2011. Retrieved 30 January 2011. ↑ "Dummies line terraces of Elland Road". Yorkshire Evening Post. 7 January 2011. Retrieved 30 January 2011. ↑ "The King's Speech". UK Film Council. Retrieved 6 October 2010. 1 2 Hoyle, Ben (9 September 2010). "Story of the King who was lost for words is an Oscar favourite". The Times. p. 23. ↑ Dunbar, Polly (23 January 2011). "Revealed: The Little Sister Who Taught Colin Firth to Stammer". The Daily Mail. London. Retrieved 31 July 2011. ↑ "The King's Voice". British Stammering Association. May 2011. Retrieved 10 May 2011. ↑ Ward, Victoria (5 May 2011). "Colin Firth admits he is struggling to lose his stutter". The Daily Telegraph. Retrieved 21 July 2011. 1 2 3 4 Martens, T. (26 November 2010). "The sound of silence: Alexandre Desplat on the music that 'just floats' throughout 'The King's Speech'". Pop & hiss (LA Times music blog). Retrieved 9 February 2011. ↑ McNab, K. (27 January 2011). "The King's Speech score review". www.soundonsight.org. Retrieved 9 February 2011. ↑ Hooper, Tom (21 January 2011). "The King's Speech director Tom Hooper answers your questions – live!". The Guardian Film blog Retrieved on 6 July 2011 (archived by WebCite on 6 July 2011). 1 2 3 4 Appelo, T. (31 January 2011). "The 5 Secrets of Tom Hooper’s ‘King’s Speech’ Success". The Hollywood Reporter. Retrieved 9 February 2011. 1 2 3 Dargis, M. (25 November 2010). "The King’s English, Albeit With Twisted Tongue". The New York Times. Retrieved 6 February 2011. 1 2 3 Ebert, Roger (15 December 2010). "The King's Speech :Review". Rogerebert.suntimes.com. Retrieved 30 January 2011. 1 2 3 Filler, M. (25 January 2011). "Hollywood's Royal Stammer". NYR Blog. Retrieved 9 February 2011. ↑ Schultz, Cathy (4 January 2011). "History in the Movies". The Bulletin. Retrieved 4 January 2011. ↑ Meacham, S. (10 November 2011) King's voice coach calmed a nation. Sydney Morning Herald. Retrieved 20 August 2011. ↑ Henley, J. (9 January 2011). "How historically accurate is the King's Speech?". The Guardian. Retrieved 3 February 2011. ↑ "Lionel Logue 'never swore in front of King George VI'". BBC Radio Leicester. 27 January 2011. Retrieved 27 January 2011. 1 2 3 Roberts, A. (6 January 2011). "How the King found his voice". The Daily Telegraph. London. Retrieved 30 January 2011. ↑ Chotiner, I. (6 January 2011). "Royal Mess". The New Republic. Retrieved 9 January 2011. ↑ Zohn, Patricia (11 February 2011). "David Seidler Protects and Defends The King's Speech". Huffington Post. Retrieved 4 August 2011. ↑ For critiques of the film, see e.g., Hitchens FN 47 and Chotiner FN 44. For historical sources substantiating Churchill's stance during the abdication crisis, see e.g., Roy Jenkins's biography of Churchill (2001) and Frances Donaldson's biography of Edward VIII (1976). 1 2 Hitchens, Christopher (24 January 2011). "Churchill Didn't Say That". Slate. Retrieved 9 February 2011. ↑ "Unthinkable? Historically accurate films". London: The Guardian. 29 January 2011. Retrieved 23 July 2011. ↑ "Firth movie lands Toronto Film Festival prize". BBC News. 20 September 2010. Retrieved 6 October 2010. ↑ "New Poster for 'The King's Speech' Keeps it Simple". The Film Stage. Retrieved 2 December 2010. ↑ Appelo, T. (8 December 2010) "'The King's Speech' Poster and Queen Bonham Carter's Oscar Problem". The Hollywood Reporter. Retrieved 19 August 2011. ↑ "The Weinstein Company Acquires The King's Speech". Comingsoon.net. 2 September 2009. Retrieved 6 December 2009. ↑ "Colin Firth welcomes censors' reclassification decision". BBC News. 22 October 2010. Retrieved on 23 October 2010 (archived on 3 January 2011). ↑ "The King's Speech". British Board of Film Classification. Retrieved on 23 October 2010 (archived by WebCite on 3 January 2011). ↑ Goldstein, Patrick (1 November 2010). "To the MPAA ratings board, 'The King's Speech' is just as bad as 'Saw 3D'". The Big Picture (Tribune Company). Retrieved on 7 November 2010 (archived by WebCite on 3 January 2011). ↑ Child, B. (26 January 2011). "King's Speech re-edit could cut swearing". The Guardian. Retrieved 2 February 2011. ↑ Labrecque, J. (31 January 2011). "Tom Hooper on PG-13 'King's Speech': 'I wouldn't support cutting the film in any way' – EXCLUSIVE". Entertainment Weekly. Retrieved 5 February 2011. ↑ Kemp, Stuart (1 March 2011). "Firth rejects 'cleaned-up' version of film". The Independent. Retrieved 21 July 2011. ↑ "Scrubbed 'King's Speech' gets PG-13 rating". Los Angeles Times. 26 February 2011. Retrieved 27 February 2011. ↑ Vilkomerson, Sara (24 March 2011). "'The King's Speech' to be re-released as PG-13 version on April 1". Entertainment Weekly. Retrieved 28 May 2011. ↑ Gant, C. (11 January 2011). "The King's Speech rouses Britain to the box office". The Guardian Blog Retrieved 3 February 2011. ↑ Gant, C. (1 February 2011). "Tangled's revamped princess tale dethrones The King's Speech". The Guardian Blog Retrieved 3 February 2011. ↑ "Arthouse Audit: 'King's Speech' Has Royal Debut". Box Office Mojo. Retrieved 1 December 2010. ↑ Kwek, Glenda (6 January 2010). "Stutterly marvellous: why we clamour for the stammer story". The Sydney Morning Herald. Retrieved 7 January 2011. ↑ Dawtrey, Adam (12 March 2011). "Slicing 'King's' profit pie". Variety. Retrieved 4 August 2011. ↑ Reed, R. (22 November 2010). "Did I Stutter? The King’s Speech Is the Best Movie of the Year". New York Observer. Retrieved 8 February 2011. ↑ Holland, James R. (4 January 2010). "Movie Review: The King's Speech". California Chronicle. Retrieved 4 January 2010. ↑ Safaya, Rubin (17 December 2010). "The King’s Speech". www.cinemalogue.com. Retrieved 4 January 2010. ↑ "The King's Speech Movie Reviews, Pictures". Rotten Tomatoes. Flixster. Retrieved 26 February 2012. ↑ "Index:The King's Speech". www.metacritic.com. Retrieved 3 February 2011. 1 2 "The King's Speech Review | Empire". Empireonline.com. Retrieved 30 January 2011. ↑ Kennedy, Lisa (24 December 2010). "Movie review: 'The King's Speech' is, in a word, excellent" The Denver Post. Retrieved 4 January 2010. ↑ Bradshaw, Peter (21 October 2010). The King's Speech – review. The Guardian. Retrieved 30 January 2011. ↑ Gritten, D. (21 October 2010). "The King's Speech, London Film Festival Review". The Daily Telegraph. Retrieved 3 February 2011. ↑ Corliss, Richard (9 December 2010). "The Top 10 Everything of 2010 – Colin Firth as King George VI in The King's Speech". Time. Retrieved 13 December 2011. ↑ "British Stammering Association comments on The King's Speech". BSA. Retrieved 17 March 2011. ↑ McVeigh, Tracy (6 February 2011). "The King's Speech: spending cuts threaten £765m legacy of speech and language therapy". The Guardian. London. Retrieved 8 June 2011. ↑ Žižek, Slavoj. (22 May 2012). "Less Than Nothing: Hegel and the Shadow of Dialectical Materialism". Verso Books. Retrieved 1 February 2016. ↑ Larcombe, D. (4 February 2011). "The King's a hit with the Queen". The Sun. Retrieved 5 February 2011. ↑ "Queen 'approves' of King's Speech". BBC News. 5 February 2011. Retrieved 6 February 2011. ↑ Reynolds, Simon (13 February 2011). "Live: BAFTA Film Awards 2011 Winners". Digital Spy. Hachette Filipacchi UK. Retrieved 13 February 2011. ↑ "Glee and The Social Network dominate Golden Globes". BBC News. 17 January 2011. Retrieved 17 January 2011. ↑ Kilday, G. (3 February 2011). "Can Harvey Weinstein Keep 'The King's Speech' Oscar Mojo?". The Hollywood Reporter. Retrieved 8 February 2011. ↑ Germain, D. (30 January 2011). "Hooper earns top DGA prize for 'King's Speech'". The Huffington Post. Retrieved 8 February 2011. ↑ McNary, D. (24 January 2011). "PGA prizes 'King's Speech'". Variety. Retrieved 9 February 2011. ↑ "Firth movie lands Toronto Film Festival prize". BBC News. 20 September 2010. Retrieved 20 September 2010. ↑ "King's Speech reigns at British Independent Film awards". BBC News. Retrieved 28 February 2011. ↑ "King's Speech wins 'Spanish Oscar'". The Daily Telegraph. London. 14 February 2011. Retrieved 14 February 2011.